R u crazzzy the guards there on power trips will probably charge you $300 for the pics. Amritsar airport sole purpose is to rob you of all ur money before u leave it. Dear Musafir, for the benefit of all other members, please be kind enough to post the pictures again. We all value your contribution. Remember, these are the only ones that I managed to find, but there are some if you go to tribuneindia or search on google.com and type in "amritsar airport" or "rajasansi"
Will some1 tell me is photography in any airport in India (e.g Amritsar, Bangalore, Ahmedabad) is allowed? If not please tell me why? Will I explain to the Airport officals/CISF staff for the reason to take photography of the outside terminal building? dUDE, WHEN you get there, jus chori chori take some pictures man....wat do you want to set up a tripod and stuff?! Jus take a few snaps, if they say something put it away. If I need to design a website for the airport, some kind of private study/project for my own use or put some pics of the airport on some discussion forum, do I still need permission from officials, like proof? If yes, then how much will they charge you? Please let me know ASAP, please and answer my question carefully. I've managed to find a picture of the new terminal somewhere on the web. gillsing, if you say that the Rajasansi airport has expanded their car park much larger and more lamp pots, do you think that they've removed or chopped any trees off from the outside of the building)s)? As you walk from the aircraft and straight heading for the old terminal building(s)Which side is the new terminal building located? Is it on the left or the right? How are the airport offical staff like at the Departure terminal? Are they kind and fair or are they just RUDE? Please let me know AS SOON AS POSSIBLE!!!!!!! Now there is no way im going from BHX or LHR to New Delhi and then catch a bus/train to Jalandhar. Its a waste of time! Another thing, if the new terminal building is mult-storey, arrival on ground floor and departure on first floor, is it like IGI airport in New Delhi where there is a high road leading to the top of the departure terminal and down back at the arrival terminal? Amritsar airport has been a interest of mine for the last 20 years. I think it is great how this website gives you updates. I took some pictures of the new terminal in March this year. The complex is fairly big (2 storey building). When it is completed it will be a very modern building with all the airport facilities you find at any international airport. There will not be an elevated approach road to the first floor of the building. It will have escalators aswell as lifts. I have received some info from the AAI Head Office Delhi. The picture posted is a picture of Amritsar Airport becasue the newly built control tower is on that side of the building. P.S Can you post me any updates you may get on Amritsar airport to the email adress at the top. We will attempt to contact the Airport Authorities for some officially approved photographs of the new terminal and post them. We do not want anyone to get into trouble attempting to take unofficial photos. There's NO point on talking about photography in Amritsar airport, because it is completly FORBIDDEN! to take photos around the airport, either under a tree, near the tarmac area or where no one sees you. Any way, I've only visited the airport ONCE in 2000(arrive/depart), but my mum visits India every year to see her family, via Amritsar airport. 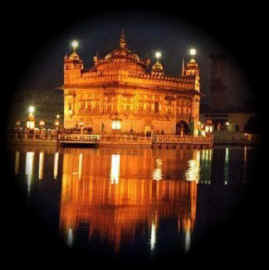 I was born in Amritsar in 1949 and since 1981 living in United States. I was so delighted to know that we can fly directly from San Francisco to Amritsar with one stop over, what a great benefit to our great city, I am planning to visit my native city this year and will fly Singapore Airline which goes directly to my city. Our Sikhs as well as Punjabi folks should use this Airport and avoid going to Delhi as much as they can, if we will support our Vatican city, world will follow us. Let everyone participate in this venture. LETS HOPE ALL THE, PUNJABI NRI,S STARTS TO AVOID, DELHI AND FLY DIRECT TO "AMRITSAR" EVEN IF IT MEANS GOING OUT OF THERE WAY. HOWEVER "DELHI WALAS" ARE NOT GOING TO BE TOO HAPPY AND WILL SHOW THERE MIGHT AND WILL TRY TO PUT A STOP TO IT. Why are fotos in Amritsar airport not allowed? Does the airport look scandallously dirty or filthy. Come on whats the secret or are the Indians still living in a time delay zone. Its the 21st century.We need to lead the world and not forever be led by others. i've recently heard from an article that photography from most indian international airports has been removed. people can take photos from inside/outside the plane. Technically, Amritsar Airport (ATQ) is still an Indian Air Force Base. I am not sure whether or not air force operations are still carried out at the airport, but I am aware that up until the 90s they were. Photo(s) of the new terminal building. Please browse down until u see the new terminal block.